Boasting the cream of all that Scotland has to offer and nestled in the dramatic setting of Highland Perthshire surrounded by woodland, moors, lochans and snow-capped Munros, we offer the discerning traveller, businessman or sporting enthusiast all that is needed to turn the average break into an experience of a lifetime. Whatever the reason for your visit to Pitcastle, it is here in this spectacular setting that you will experience true Scottish hospitality. 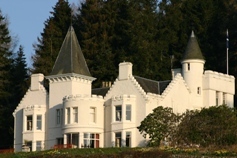 A personal haven proffering a discreet and luxurious home-from-home, Pitcastle is the first choice for those seeking a truly magical and authentic Scottish experience.